As a teacher of younger preschoolers, you spend a lot of time changing diapers, wiping noses, washing hands, warming bottles, and disinfecting toys. You may think that these mundane tasks have nothing to do with teaching preschoolers about God…but you’re wrong! What you’re doing is building a foundation of trust — a foundation that will later help children develop a trusting, personal relationship with Jesus Christ. 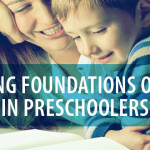 Young preschoolers learn to trust adults that they can hear, see and touch long before they can learn to trust a God they cannot hear, see or touch. They develop this trust as you meet their physical needs promptly and lovingly. As these actions are faithfully and lovingly repeated, the child learns that he can trust you — an important step in his spiritual development. Later, as the Holy Spirit prompts him to place his faith in Jesus, he must be able to trust. Because of your faithfulness in the "little things," he’ll be able to do just that. Greet them with a smile. Include their names in songs as you hold or rock them. Use Bible phrases throughout the session as you relate to them. Meet their physical and emotional needs on demand. Reassure a child when he’s anxious for his parents to arrive. Curious: Provide a clean and safe environment for them to explore. Active: Their theme verse is not, "Be still and know that I am God…" Let them move! Creative: Provide opportunities for them to express themselves. Self-focused: Help them realize that they’re precious to God — but so are their friends! Sensitive: They’ll know if you’re happy to be with them or not! Show them that you are! Limited Attention Span: Teach in short, simple ways. Literal-minded: Use simple words. If you say, “You’ve grown a foot since last time I saw you,” they’re going to look down to see that third foot! Explore Limits: They’re going to test boundaries. Be consistent. It helps them feel safe. Ask yourself, “Will I make a difference in the lives of preschoolers and their parents?” God has given you a special opportunity to help babies, ones and twos begin their journey in life. What kind of foundation will you build?